Ricky’s Gone Plain Nuts! Or Has He?! Hahahaha!!! 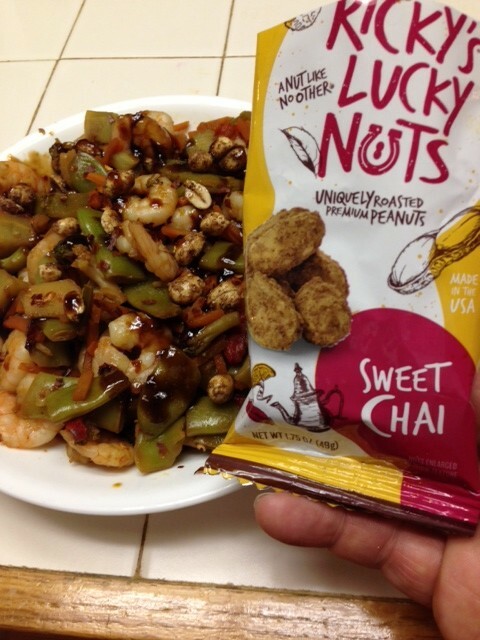 From Spicy Chipotle Chile to Sweet Chai, these are not your run of the mill snack nuts! 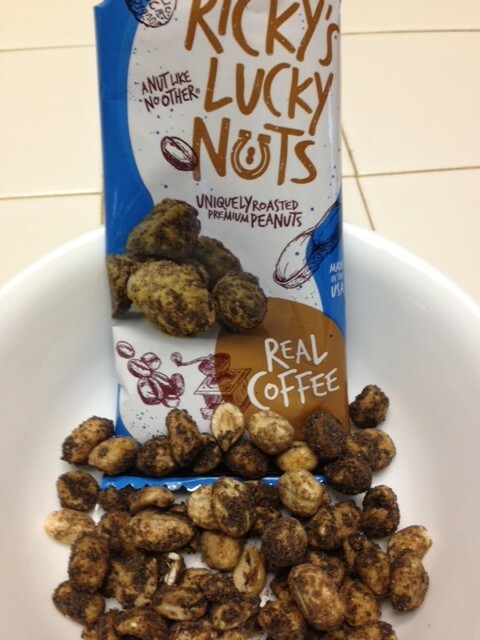 I got an email a while back from the fine folks at Ricky’s Lucky Nuts in Durango, Colorado, telling me how great their new line of snack nuts were and would I try them and give some feedback. Well, I’ve been accused before of being just a little nuts, so of course I said yes! After all, when you offer a Chilehead snacks with cool names like Thai Red Curry and Spicy Chile Chipotle (they even spelled Chile right!!! ), there’s no way you can refuse! Right?! Right! I can tell you right here and now, folks – Ricky ain’t nuts and he ain’t plain, neither!! I received 5 individual serving bags, and not your run of the mill honey roasted, jalapeno, plain roasted, etc etc etc! I got cool flavors! Hip flavors! Flavors that would make the “new” Colorado snack world proud (I’m guessing their snack food industry is working overtime these days!) I’m talkin’ munchie worthy!! In addition to the Spicy Chile Chipotle and the Thai Red Curry, I also got Black Pepper and Sea Salt, Sweet Chai, and Real Coffee. Real Coffee?! Really?! Who does a coffee peanut?! Well, evidently, Ricky does, and he does ‘em up proud, too!! The Real Coffee were my favorites, as they had an espresso type earthiness to them, and just enough sweet to take the bitter edge off and merge the coffee with the nut in beautiful fashion. The bag smelled good, and I didn’t get a dusty coating all over my fingers! Is there a cutesy slogan for flavor that stays where it plays – oh wait – that’s kinda catchy! Hmmmm…….. Back to the nuts – the coating seems like it’s baked on so it doesn’t come off, and that was true with all the flavors. Score one for Ricky, unless you’re the kind of person who likes that whole “let me lick my orange cheese curl stained fingers” vibe!!! And I’m sure there are several in Colorado- especially these days!!!! So how about the other flavors? Well, the Thai Red Curry I ate by itself and put in a stir fry along with my fav asian style hot sauce, and it was just rich enough in flavor to highlight the dish, accent the other flavors, and make me feel like I was hanging out in Bangkok! I also did the same with the Sweet Chai ! As you can see in the pic, my shrimp stir fry was awesome with that smooth but slightly off Chai note. It made an interesting flavor addition to my standard asian influences. Unlike the Red Curry used in another stir fry, where I kept my flavor additions to a minimum, I didn’t hold back while using the Chai, and it really stepped up and balanced the dish exquisitely! 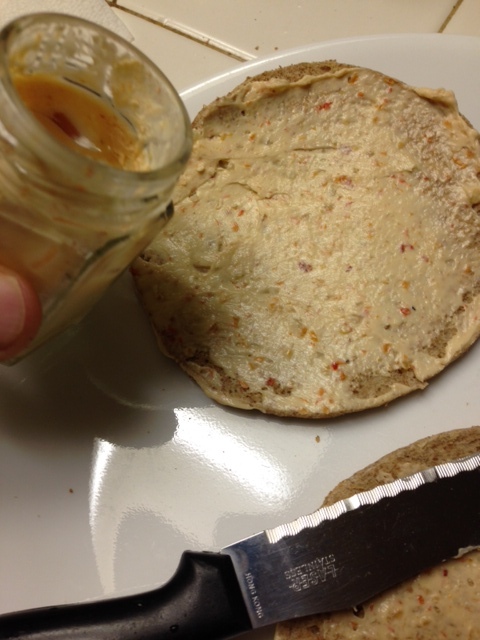 And it made for a tasty stand alone snack- subtle Chai tones surrounded by the nuttiness of an obviously high quality, lovingly roasted peanut. Well played, Ricky! From a fun and simple label to gourmet level snacking inside, these babies have it all! The Spicy Chile Chipotle was only slightly spicy, but then again, I have a pretty big tolerance. But I liked the subtleness as I woofed down the whole bag! And the whole bag did leave a nice spicy zing in the back of my throat! The Black Pepper and Sea Salt were a good snack, and also mixed in a fresh spinach, tomato, olive, and mozzarella salad. Gave a nice texture, complimented the flavors without interrupting my love affair with balsamic vinegar and EVOO, and made the salad more fun! Cause I’m sorry, but salads are booooring!!! I’ve never had black pepper in a snack nut before, and it is such a natural fit! And the sea salt was very very smooth. 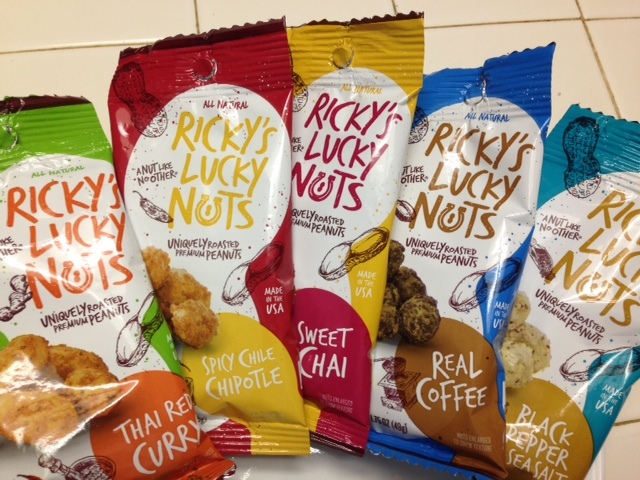 All in all, I give Ricky’s Lucky Nuts 4 Fiery Worlds! Their label is fun and has good “viewability” in a store shelf or on an end cap rack by the register! Go to their website, order you some, sit back and enjoy!!! Whether used to highlight a dish, or to snarf for a snack during those munchie attacks, you won’t be sorry! And that’s because, Ladies and Gentlemen, It’s a Fiery World!! !